Mining is a major source of environmental degradation in mountains. To assess the negative impact of mining on aquatic ecosystems, the bottom communities of a small mountain Breksа river (South-Western Altai), which receives drainage water from the mining enterprises, were investigated. Macroinvertebrate samples were taken monthly from April to October 2005-2010 at the background site and the impact zone of Breksa river. A significant decrease in macroinvertebrate species richness was found in the impact zone as compared to the background site. Each sample upstream from the impact zone contained 18±1.5 macroinvertebrate species, while downstream – only 6.5±0.6 species. The species richness correlated negatively with the content of suspended substances in water (r=-0.32) and the concentration of heavy metals (r=-0.69). Changes in the composition of the most frequent species caused by pollution are revealed. The most sensitive and resistant to pollution macroinvertebrates are presented. The most sensitive to pollution are mayflies Epeorus pellucidus, Neoleptophlebia chocolatа, caddisflies Hydropsyche newae, Brachycentrus americanus, Dicosmoecus palatus, Glossosoma altaicum, and crustaceans Gammarus korbuensis. The most resistant are chironomids larvae. The data obtained prove the necessity of regional modifications of widespread European methods of water quality bioindication. Alvial, I.E., Tapia, D.H., Castro, M.J., Duran, B.C., Verdugo, C.A. (2012). Analysis of benthic macroinvertebrates and biotic indices to evaluate water quality in rivers impacted by mining activities in northern Chile. Knowledge and Management of Aquatic Ecosystems, 407, doi: 10.1051/kmae/2012027. Bakanov, A.I. (2005). Kolichestvennaya ocenka dominirovaniya v ehkologicheskih soobshchestvah [The quantitative assessment of dominance in ecological communities]. Kolichestvennye metody ehkologii i gidrobiologii. Tol'yatti. pp. 37–67 (in Russian). Bioraznoobrazie i dinamika ehkosistem: informacionnye tekhnologii i modelirovanie (2006) [Biodiversity and dynamics of ecosystems: Information technologies and modeling]. SB RAS, Novosibirsk (in Russian). Malaj, E., Grote, M., Schäfer, R.B., Brack, W., Carsten von der Ohe, P. (2012). Physiological sensitivity of freshwater macroinvertebrates to heavy metals. Environ Toxicol Chem, 31(8), 1754–1764, doi: 10.1002/etc.1868. Maret, T.R., Cain, D.J., MacCoy, D.E. and Short, T.M. (2003). Response of benthic invertebrate assemblages to metal exposure and bioaccumulation associated with hard-rock mining in northwestern streams USA. J. N. Am. Benthol. Soc., 22, 598–620. Morgen, C., Trumble, J. (2010). The impact of metals and metalloids on insect behaviour. Entomologia Experimentalis et Applicata, 135, 1−17. Qu, X., Wu, N., Tang, T., Ca, Q. and Park, Y-S. (2010). Effects of heavy metals on benthic macroinvertebrate communities in high mountain streams. Ann. Limnol. - Int. J. Lim., 46, 291–302, doi: 10.1051/limn/2010027. Smolders, A., Lock, R., Van der Velde, G. et al. (2003) Effects of Mining Activities on Heavy Metal Concentrations in Water, Sediment, and Macroinvertebrates in Different Reaches of the Pilcomayo River, South America. Arch. Environ. Contam. Toxicol., 44, 0314. doi: 10.1007/s00244-002-2042-1. Stockdale, A., Tipping, E., Lofts, S., Ormerod, S.J., Clements, W.H., Blust, R. (2010) Toxicity of proton–metal mixtures in the field: linking stream macroinvertebrate species diversity to chemical speciation and bioavailability. Aquat Toxicol, 100, 112–119. doi:10.1016/j.aquat ox.2010.07.018. Yanygina, L.V. (2017) Macrozoobenthos as an indicator of the ecological state of mountain watercourses. 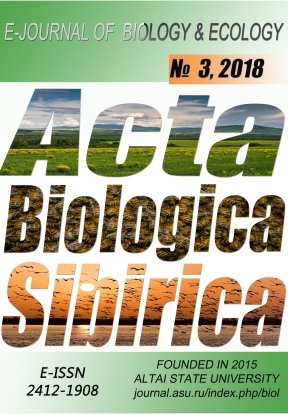 Russian Journal of Ecology, 2017, 48(2), 185–190.